These 15 Inventions (BWV 772-786) are a collection of short keyboard works written by Johann Sebastian Bach as exercises for of his students. 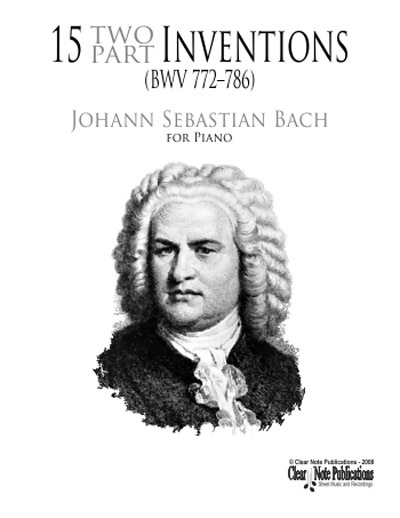 Bach described the collection as an "Honest method, by which amateurs of the keyboard – especially those desirous of learning – are shown a clear way to learn to play cleanly in two parts..."
In musical terms, an invention is a short composition that is written in two-part counterpoint. The most well-known are these fifteen, and they make up the first half of Bach's 30 Inventions and Sinfonias. Compositions in the same style as an invention that use three-part counterpoint are known as sinfonias. Publishers sometimes call sinfonias "threepart inventions" to avoid confusing sinfonias with symphonies.